Click to launch Echo demo application. 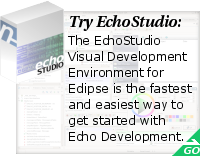 Echo is a platform for building web-based applications that approach the capabilities of rich clients. The applications are developed using a component-oriented and event-driven API, eliminating the need to deal with the "page-based" nature of browsers. To the developer, Echo works just like a user interface toolkit. 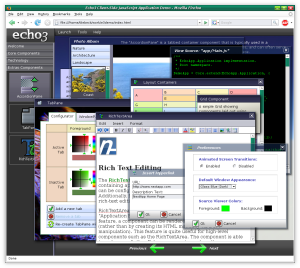 Echo is open-source software, licensed under the Mozilla Public License. Download Echo3 and component libraries. Start learning Echo3 by reading the Echo3 Developer's Guide. Get community support at the Developer Forums. Report bugs and request features using the Bugtracker. Find more resources at the Wiki. See more Echo Demo Apps.